KCATA is hosting two public meetings on the plan for re-designing downtown transit. Please attend and comment on the vision and proposed changes. What: Public Community Meetings (Presentation followed by open house format) See flyer here. Where: Kansas City Design Center, 1018 Baltimore, Kansas City, Mo. This proposed service improvement would significantly change how transit flows downtown. The changes are being proposed because the 10th and Main Transit Center is too small to handle the bus and streetcar traffic. Additionally, new developments downtown are impacting travel demands. 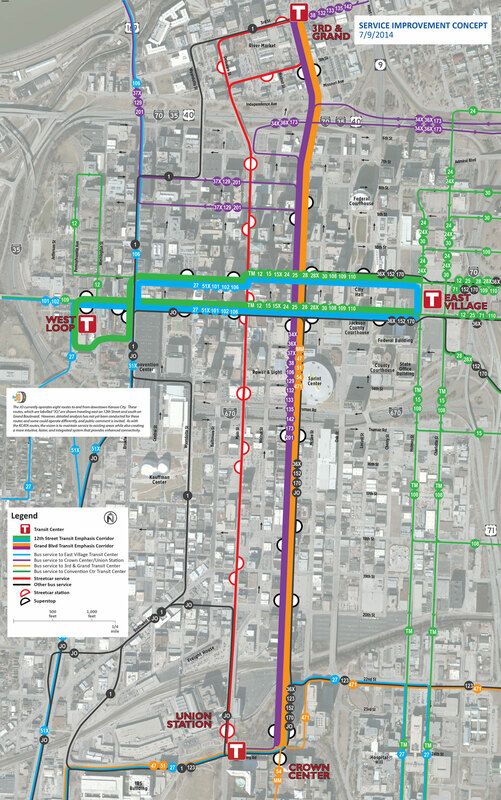 The reconfiguration of downtown routes based on an intersecting trunk route service design, forming Transit Emphasis Corridors (TEC) along Grand Boulevard and 11th and 12th Streets to simplify, accelerate, and improve downtown transit service. Facilitate connections between bus routes and streetcar service. Bus lanes on Grand Boulevard and on 11th and 12th Streets to make service faster and more reliable. The consolidation of regular bus stops into Transit Emphasis Corridor (TEC) Stations to make waiting more comfortable and service faster. TEC Stations would provide facilities and amenities similar to MAX stops. The development of a new East Village transit hub to improve connections and elimination of 10th & Main Transit Center. More information about this project can be found here including maps of proposed route changes. The proposal includes changing The JO routes downtown and additional changes to Route 51-Ward Parkway. This entry was posted on February 10, 2015 at 4:02 PM	and is filed under Events, Local Transit Issues. Tagged: KCATA. You can follow any responses to this entry through the RSS 2.0 feed. You can leave a response, or trackback from your own site.